Secretary Pritzker Swearing in 27 Foreign Commercial Service officers and one Intellectual Property Attaché from the Patent and Trademark Office to the Commerce team. 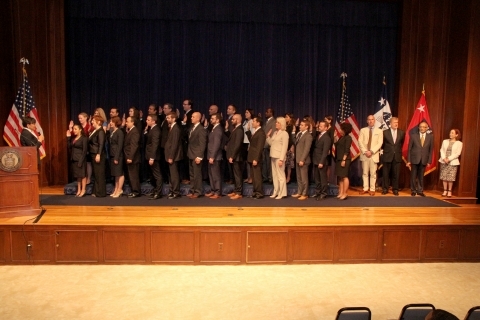 Today, in a formal swearing-in ceremony, Commerce Secretary Penny Pritzker welcomed 27 Foreign Commercial Service officers and one Intellectual Property Attaché from the Patent and Trademark Office to the Commerce team. The U.S. Commercial Service is the trade promotion arm of the U.S. Department of Commerce’s International Trade Administration. The new officers will use their unique skills to match U.S. companies with foreign partners, reduce trade barriers, fight intellectual property rights violations, and attract investment to America’s shores. Stefan Selig, Under Secretary for International Trade, Arun Kumar, Assistant Secretary and Director General of Global Markets and Shira Perlmutter, United States Patent and Trademark Office Chief Policy Officer and Director for International Affairs were also in attendance. For their first assignments, 14 officers have been selected to go to overseas posts, 9 will work in domestic field offices around the country and 5 will serve here in Washington, D.C. The Commercial Service officers went through a rigorous screening process and were selected from over 2,800 candidates. Most of the new officers cultivated their expertise in international trade from previous federal or state government service, while others previously held positions in the private sector in fields such as energy, financial services, pharmaceuticals, publishing, entertainment, and consulting. These new officers bring a wealth of knowledge, skills, and real world experience to their positions that will assist them in helping U.S. companies capitalize on global opportunities. For example, new Commercial Service Officer Suzanne “JK” Platt will leverage her many years of experience in the pharmaceutical industry to help American businesses compete and sell their goods and services worldwide. She spent the last five years with a manufacturer, supporting their exports to Europe, the Middle East, and North Africa, where she worked on commercial flows into and with the EU, while also supporting new distribution channels and operations. Companies today are born global. From brand new start-ups to established multi-nationals, all are looking for the next export opportunity to expand their bottom line. President Obama, the Commerce Department, and the entire Administration understand that, for domestic firms to succeed, they must reach the 96 percent of customers who live beyond our borders. The President has made exporting a key priority of this Administration, resulting in 5 years of record-breaking levels of goods and services sold abroad.. The Obama Administration has set forth a robust trade agenda to help level the playing field for American businesses and their workers through modern, high-standard trade agreements like the Trans-Pacific Partnership (TPP) and the Transatlantic Trade and Investment Partnership (TTIP). As we look to complete these trade deals, the Commercial Service will be on the front lines of implementing these deals and ensuring American companies can capitalize on new opportunities in the Asia-Pacific, Europe, and elsewhere. The new officers will join the ranks of the Commercial Service’s cadre of talented professionals working in nearly 80countries and 100 domestic locations assisting U.S. companies in exporting and increasing sales to new global markets. Congratulations to the newest class of Commercial Service officers.